Last month we had a short family trip up to Scotland - back to my favourite area on the west coast. We'd decided to travel with 3 dogs in tow so were limited on options for where to stay but struck it lucky with a beautiful rented cottage on the Ardmaddy Estate. We weren't quite so lucky with the weather (having arrived in the lead up to 'Storm Desmond') but we made the most of the few moments that the sunshine managed to break through the clouds. 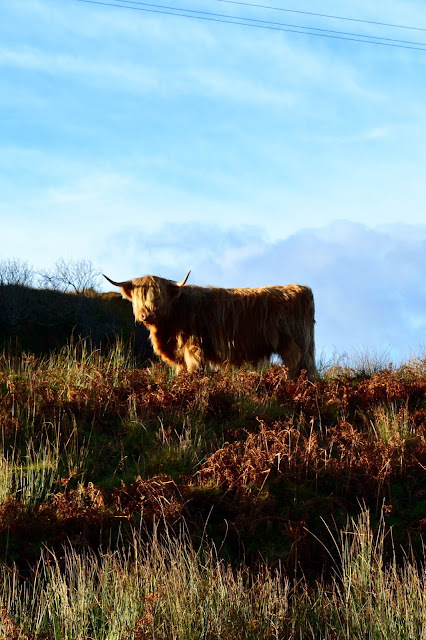 The Ardmaddy estate is only a few miles from the Isle of Seil - which gave us the perfect opportunity to explore this ruggedly beautiful island. A few weeks ago I was lucky enough to be invited to preview the F&F Spring/Summer collection in London. If you're a fairly frequent visitor to this blog you'll know that I'm a big fan of the F&F brand and have featured a fair few of their pieces in the past - so I was naturally curious about their latest collection. On a chilly, rainy November day in London, the collection was a breath of fresh air and has already got me thinking about my summer hols next year. The collection as a whole was heavily influenced by the idea of travel. The lookbook collection underpinned this by featuring linens and a nautical theme, interspersed with some corals, while the other collections all took inspiration from a different part of the globe (my favourite of which was 'Latin Rose'). Delicate fabrics with intricate florals and watercolour inspired designs were interspersed with slightly heavier fabrics which leant themselves to the ongoing trend for 70s nostalgia.